Our criminal justice system should keep us safe, treat people fairly and respectfully, and be flexible and ready to change with the times. However, we are currently saddled with an outdated, unfair and bloated criminal justice system that drains resources and disrupts communities. Our prisons are too big and too full, and our reasons for locking people up are not well-thought out. Our policies have been overly punitive and have created incentives that promote inefficiency, systemic racial discrimination, and high levels of incarceration. To promote pragmatic law enforcement that supports communities, the government should prioritize communities over incarceration. 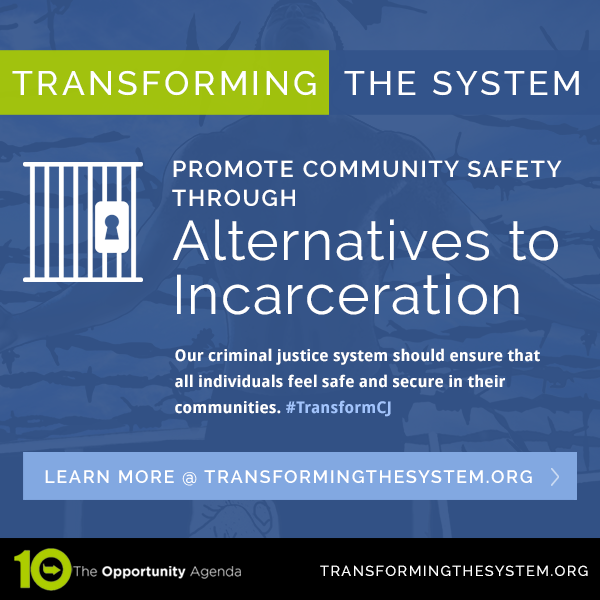 Criminal justice policies should incentivize the reduction of the incarceration rate, work to eliminate racial discrimination, and aim to heal communities that have been harmed by the high rates of incarceration through the incorporation of restorative justice practices and the creation of community healing spaces. The President should draft an Executive Order, based on the executive authority to set prosecutorial priorities and to manage the federal prisons system, directing federal law enforcement agencies to prioritize policies and practices that reduce incarceration and prioritize community investment over imprisonment as a strategy for ensuring public safety. The DOJ Civil Rights Division and the DOJ Office of Community Oriented Policing Services should work together to ensure police departments that are under investigation or have outstanding cases for statutory and constitutional violations are not awarded grants to hire additional police officers by establishing an interagency taskforce dedicated to ensuring that the DOJ is not inadvertently rewarding bad actors. The Department of Justice (DOJ) should only fund law enforcement agencies that provide specific and demonstrable action plans for addressing unwarranted racial disparities and racial profiling in law enforcement activities in their funding applications to ensure compliance with Title VI of the Civil Rights Act of 1964. Legislatures should prohibit performance metrics that reward criminal justice agents for increasing their volumes of prosecutions, tickets, summonses, arrests, probation violations, and other punitive civilian encounters; provide protection for whistle-blowers to report unofficial “volume-based” performance metrics; and create strict penalties for law enforcement agencies with such unofficial policies. Local governments and the judiciary should establish restorative justice programs that address community justice matters, including programs that address serious offenses. Restorative justice programs seek to repair the harm caused to victims and communities, and include practices such as family group conferences, mediation, community decision making, and mechanisms for restitution. The President ensure that pardons, which fully or conditionally forgive crimes, are used more extensively to address injustice in the criminal justice system, including taking steps to provide additional resources to the Pardons Office. Furthermore, the President should expedite the commutations process and eliminate bureaucratic barriers to relief. Local, state, and federal governments should re-commit to human rights by complying with human rights standards for racial equity, incorporating human rights into employee trainings, orientations, and handbooks for employees in institutions within the criminal justice system, and allowing United Nations officials and experts unrestricted access to inspect U.S. prisons and jails. Local and state legislatures should pass legislation that establishes commissions for truth and/or reconciliation, where there is a history of past abuse and/or community mistrust of law enforcement. These commissions should be tasked with making recommendations based on their findings. The DOJ should incentivize healthy relationships between the community and law enforcement agencies by prioritizing law enforcement agencies that have a substantive community outreach strategy detailed in funding applications. Policymakers should incorporate the voices of people who have been directly impacted by the criminal justice system, including formerly incarcerated people, and survivors of police violence in the development of laws and policies that impact them. 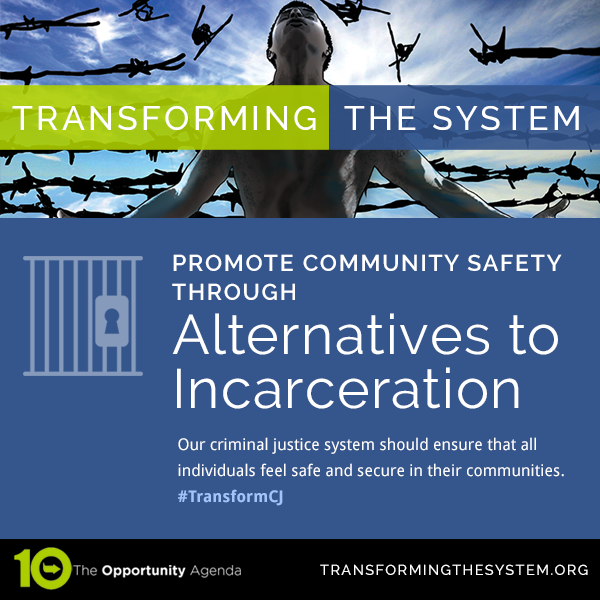 This engagement should include incorporating the substantive policy suggestions of those who have been most impacted by the criminal justice system. Advocates, activists, cultural workers and artists, and civil society should adopt a framework that highlights issues experienced by community members with intersectional identities, including women of color, formerly incarcerated individuals, black women, migrants, Muslim youth, Native American women and youth, LGBTQ people of color, transgender people of color, amongst others. Policymakers should incorporate an intersectional analysis when evaluating policies. Law Enforcement Assisted Diversion (LEAD) in Seattle is a pre-booking diversion program developed with the community to address less serious crimes in Seattle. The program allows law enforcement officers to direct people to community-based services instead of jail. Our criminal justice system should keep us safe, treat people fairly and respectfully, and be flexible and ready to change with the times. This means taking a careful look at why and how we imprison people in this country, and making changes in the system when it no longer meets our goals or supports our values. However, we are currently saddled with an outdated, unfair and bloated criminal justice system that drains resources and disrupts communities. Our prisons are too big and too full, and our reasons for locking people up are not well-thought out. Adding to this issue, a number of incentives exist that encourage the continuous reliance on prisons. For instance, many communities measure law enforcement success by the volume of prosecutions and prison sentences instead of decreases in crime or improvements in community safety. To promote pragmatic law enforcement that supports communities, legislatures should prohibit the evaluation of police and prosecutors that focus on arrest, prosecution or imprisonment numbers over increases in public safety. Tell your legislators to compel prosecutors and police departments to focus on real indicators of community safety instead of numbers that only show their ability to lock people up. But our current laws see prison and detention as the main solution to every drug issue, immigration infraction, mental health situation, and so on. As a result, we are disrupting lives and communities by locking away people who pose no harm to society. Impact Justice, an innovation and research center committed to “fostering a more humane, responsive, and restorative system of justice in our nation” that creates resources and provides training to implement restorative justice. The Movement for Black Lives has outlined a comprehensive policy platform for upholding black dignity and black humanity.